If you want a thriller to keep you on the edge of your seat, then Ira Levin’s Deathtrap is the play for you. Written in 1978, it has many surprising plot twists and is a play within a play. This play holds the record for the longest running comedy-thriller on Broadway. Levin wrote the novels Rosemary’s Baby and Stepford Wives and the Boys from Brazil, which were all adapted into plays and films. Deathtrap too was made into a film starring Christopher Reeve, and Michael Caine. Sidney Bruhl, (Paul Bradley) a once-successful writer of stage thrillers, has writer’s block. When a young playwright Clifford Anderson (Sam Phillips) sends Bruhl his brilliant new play Deathtrap, Bruhl decides to kill the newcomer and pass the play off as his own, or does he? Paul, unrecognisable as the character Nigel that he played in EastEnders, dominates the stage both with his witty delivery, energy and the physicality required as the plot evolves. The writer’s wife (Jessie Wallace), another EastEnder, tries to talk him out of his cunning plan. She played the part well, but there was very little that she could contribute, as the wife is there merely as a plot device. As the play is set in America I was a little concerned that the accents would be unstable, but all the cast kept them going realistically. I particularly liked the dramatic music effect that blasted the audience out of their seats at the start. It also constantly took them by surprise throughout, when they were already reeling from yet another twist in the tale. Additionally, there was an inventive use of projected film noir clips that also helped create the tense atmosphere. Additionally, this was a useful device when set clearing was required. There were excerpts from Gaslight, Dial M for Murder, Witness for the Prosecution and Sleuth. In fact, the tricks and twists were reminiscent of the latter. The scenes between Paul Bradley and Sam Phillips were very well done with clever interplay and extremely realistic murder scenes. The plot was packed with twists and reversals that still have the power to shock. Phillips played the part of the youthful writer who was not all he seemed, first as an admiring fan, then changing to a manipulative, and cunning character. However, the inference of a gay relationship was a little unbelievable, as there was no physical chemistry between the two and it took the audience by surprise and elicited embarrassed laughter. The whole time the audience were kept on a knife-edge. 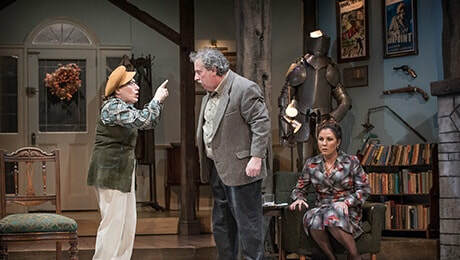 However, the tense atmosphere was rather spoiled by the scenes with an over the top clairvoyant ( Beverley Klein), that made the play a comedy thriller. They were farcical and she was played as a complete caricature of a demented foreigner. I was unsure if that was the way Ira Levin depicted her, or whether it was the result of direction by Adam Penford. The play ends with a shock, and then continues with another comic scene that sums up events with which the audience are already familiar. Most of them were perplexed as to why that scene was there, and it appears to be just for comic effect. The excellent set, by designer Morgan Large, conveyed a converted stable, in an old colonial building. It was very impressive, with beams, weaponry around the walls and even a suit of armour. There was a comic moment when it seemed to acquire a life of its own. There were also some excellent sound and light effects, particularly during the storm. Although Deathtrap is a gripping thriller, it is has some witty one-liners and amusing moments. It is a long time since I have seen a thriller that was so complicated and intense and held the audience from start to finish. Not only does it have the usual twists and turns, but there are shock horror moments that make the audience gasp. This thriller is a brilliant evening’s entertainment, with a complicated plot and will have you on the edge of your seat. We thought it was slow in parts and didn’t think that the acting of the clairvoyant suited the play. However, we enjoyed it. The play was full of twists and turns and we would recommend it to any murder mystery fans. It was a very clever idea and was very well acted. It was realistic but I found the ending with the clairvoyant and the solicitor rather silly and unnecessary. The first half was very tight but I thought the play lost its way in the end. The graphic murder and the music was particularly well done.